Punctuate the ends of your sofa or create a circular seating area which allows everyone to interact easily with our Amish Landmark Wedge Shaped End Table. If you want your living room or a seating area in your office or bedroom to have a rounded look, a wedge-shaped end table will allow you to achieve the look you are going for. Place a couple of these occasional tables at either end of a rectangular or rounded sofa to give a space a circular feel and help to create a division in an open floor plan. Or, place one between two chairs in a seating area, making it easier for people lounging there to interact. Along with its wedge-shape, this mission style accent includes a 1" thick top, vertical mission-style slats, corbels, and an open shelf. 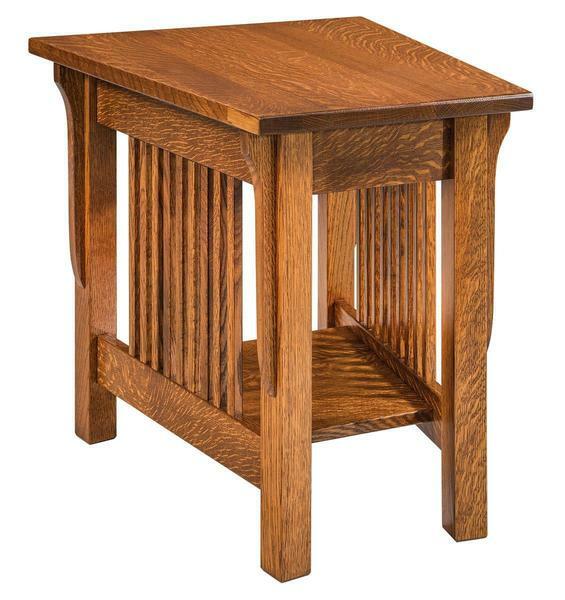 Shown in quarter sawn white oak with Michael's cherry stain and #16 hardware.